As the Christmas shopping season approaches, the Entertainment Software Rating Board has created new "rating summaries" for videogames, providing game buyers an objective look at the "context and relevant content that factored into a game's ESRB rating assignment." The ESRB is now providing rating summaries on its website for all games rated since July 1 2008*, as well as through a new mobile website at m.esrb.org which will let consumers check game summaries over their mobile phones while they shop. The new information will supplement the well-established rating categories and content descriptors already in use by the ESRB. "Research shows that the vast majority of parents who purchase games for their kids are aware of and regularly check ESRB ratings, but parents can always use more help when making choices as to which games are right for their children," said ESRB President Patricia Vance. "With our new rating summaries, which provide exclusive and unprecedented insight into the nature of the content that triggered a given rating assignment, parents will be that much more empowered in making those choices." "Videogames can be entertaining for children, but parents need to be cognizant that there are some games that are neither created nor intended for children," added National Institute of Media and the Family founder David Walsh, a frequent critic of videogames and the ESRB who nonetheless elected to take part in the announcement. "ESRB ratings provide a guide that parents can and should use to determine whether a game is one they deem appropriate for their child. The ESRB's rating summaries go even further, shedding greater light on a game's rating and giving parents additional detailed information to make healthier gaming decisions." "I commend the ESRB for taking this step to serve the needs of parents," he added. 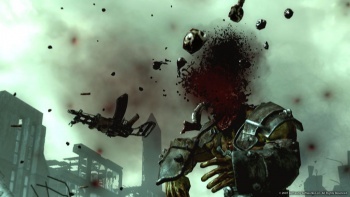 Examples of games that have received the new rating summaries on the ESRB website include Far Cry 2 ("Combat can be frenetic with repeated screen shakes and realistic sound effects"), Dead Space ("Characters lose limbs and heads, accompanied by sprays, stains, and gushes of red blood") and Fallout 3 ("You will get frikkin' eyeballs in your hair"). To learn more about the new videogame rating summaries, check out www.esrb.org. *[UPDATE]: Ratings summaries will be available for all games rated since July 1, 2008, not released, as was originally reported.